Lisa Koop just moved into a new office. In place of a receptionist, there’s a sticky note stuck to the front door that reads “Please Knock,” and there are toys in the small lobby for children to play with. There are big, inviting windows, and, most importantly, clients continue to stream in. Koop, a Goshen College alum, works for the National Immigrant Justice Center (NIJC), a Chicago-based non-profit that provides affordable legal defense to immigrants and refugees. Koop began at the NIJC in 2006 and helped to open a Goshen branch in 2014, in addition to the South Bend and Chicago locations. The new office, located at 110 E. Washington St., opened in October. Koop graduated from GC in 1999, taking away a double major in English and psychology and a commitment to social justice. She joined Mennonite Voluntary Service (MVS) and ended up in Harlingen, Texas, a city 25 miles off of the U.S.-Mexico border. There she worked with the non-profit ProBAR to assist immigrants in detention who were arrested by border patrol after crossing into the country. After two years with MVS, Koop came back to Indiana for law school, with a clear focus on immigration law. Finishing a two-year fellowship at Notre Dame, Koop connected with the NIJC. Eleven years later, the ever-changing nature of the work has kept it compelling. Koop began as a staff attorney, a position that brought her into court up to a couple times a week providing direct representation for clients. Direct services remains an important part of her work, but she now also supervises the NIJC’s asylum program, which works to provide protection for people who have fled their countries of origin due to persecution. She has also added federal litigation work to her agenda, trying to favorably change interpretations of immigration laws through progress made in individual cases. Additionally, Koop teaches a practicum course at Notre Dame, working with law students to expose them to immigration law. Organizations doing work like the NIJC’s are few and far between, especially in Indiana. Clients travel from Indianapolis and Fort Wayne regularly, in part because they have to go to court in Chicago. In the context of the current presidential administration, it is more important than ever that immigrants facing deportation have access to legal representation. Some of the changes Koop and her team are fighting include the decision to end the Deferred Action for Childhood Arrivals (DACA) program and the decrease of protection for asylum seekers. 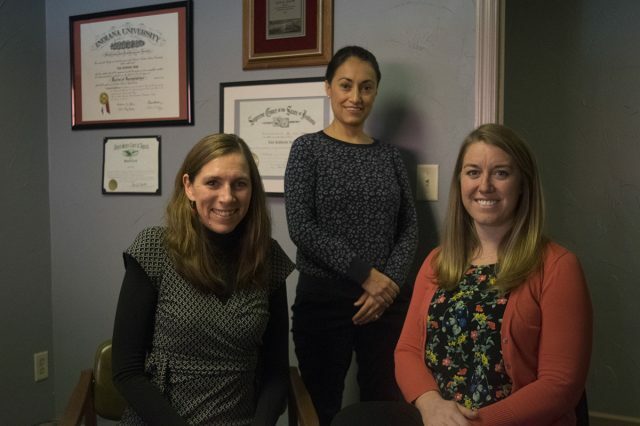 In the past year, Immigration and Customs Enforcement (ICE) agents are more frequently visiting clients’ homes and placing them in deportation proceedings. Despite the bleak direction immigration litigation is taking, there is still hope, especially when cases are brought into court. In the office, the key to sustaining energy is fostering a positive and supportive environment. Koop works alongside attorney Maria Blumenfeld and two paralegals, also GC grads, Brittany Herschberger (‘10) and Maddie Birky (‘17). However, the drive really comes from the nature of the work.